The prestigious Jazz a Juan jazz festival held each year in Juan-les-Pins is the oldest continuously running jazz festival in Europe. Since 1960 a steady stream of the world's finest jazzmen and jazzwomen have brought their instruments and voices to Juan-les-Pins, treating audiences to top-level jazz. On the Pinède Gould stage such legendary artists as Sonny Rollins, Charles Mingus, Ray Charles, Miles Davis and Ella Fitzgerald have made the festival an obligatory stop for jazz-lovers. In addition to the main festival, there are free concerts by local jazz musicians in venues around town. The connection between Juan-les-Pins and jazz extends to the early 20th century when Antibes/Juan-les-Pins was a hub for writers and artists as well as musicians such as Sidney Bechet. F. Scott Fitzgerald and his socialite pals, Gerald and Sarah Murphy vacationed there, bringing a love of jazz with them. The pine grove known as the Pinede Gould became the scene of a popular music hall that attracted Parisian vaudeville stars and early jazz musicians. The first Jazz a Juan was launched to pay tribute to Sidney Bechet and it became an enduring success. Jazz a Juan takes place outdoors in in mid-July when the weather is sure to be mild enough to enjoy the nighttime concerts. The stage is set against the backdrop of the sea and framed by parasol pines. Watching the sun fading into twilight as a swirl of rythms and harmonies pour into the night is an experience not to be missed. Tickets can be reserved online and in advance. Click here. Depending on the price, tickets may or may not be for assigned seats. As the venue is comparatively small and the acoustical system excellent, even the cheapest tickets provide good sound and visibility. 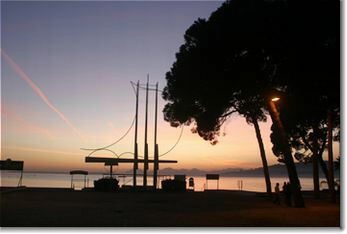 Juan-les-Pins is accessible by train or bus. More.